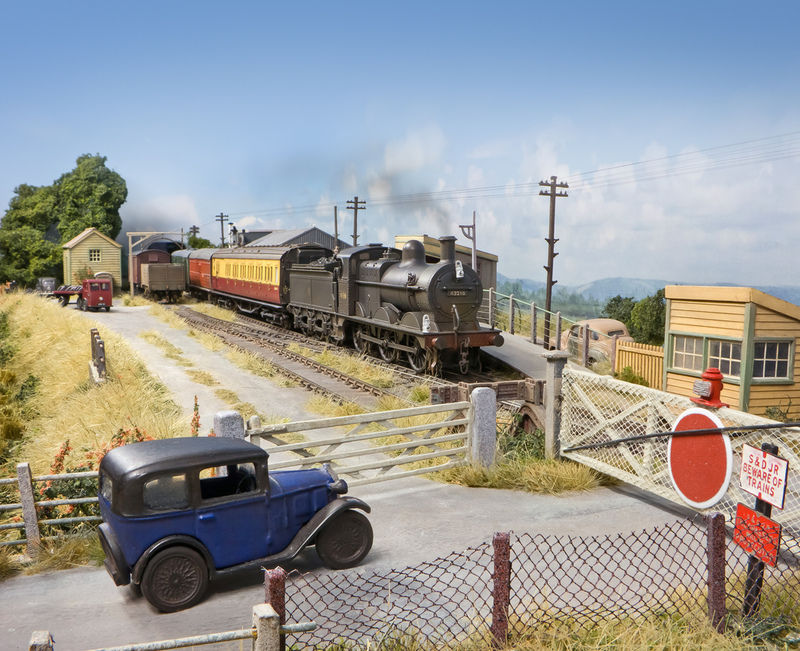 I'm often asked about Catcott, so here is a reprint of my 2008 Hornby Magazine feature on the layout. 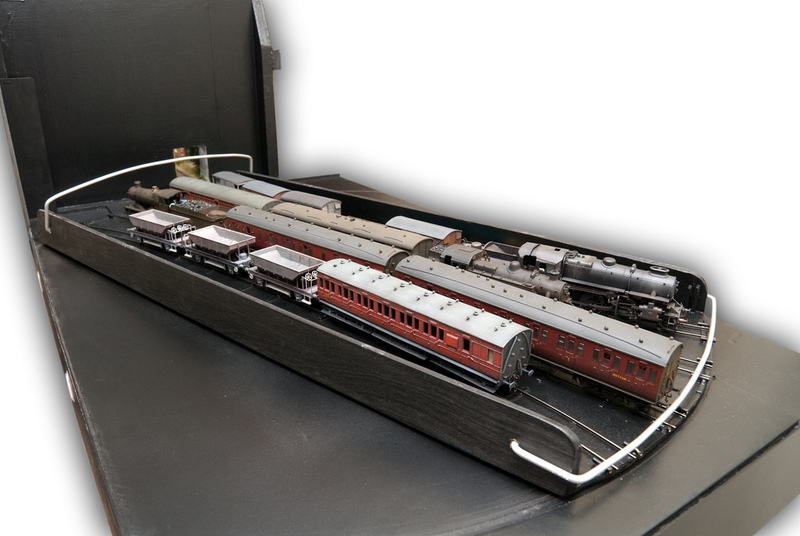 Size: 5’00”x15” (11’00”x15” including fiddle yard). Scale & Gauge: 00/16.5mm finescale. Era: 1950’s & 1960’s British Railways, former Somerset & Dorset Joint Railway. 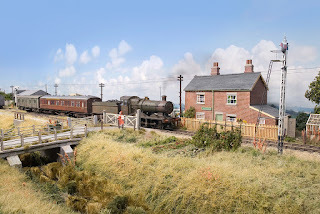 Scenario: Part reality and part fiction ‘what if’ scenario, had the real Catcott Crossing become a small halt with sidings. Track: Hand-built using C&L components and C&L flexi-track. In this delightful area of Somerset also known as ‘Sedgemoor’, the topography in this area just to the south of the Mendip Hills is very flat with the boggy land being only a few feet above sea level. Made famous by the 1963 BBC documentary ‘A Branchline Railway’ hosted by poet laureate Sir John Betjemen, viewers of this delightful film will know that railway between Glastonbury and Highbridge for much of its length followed the course of the Glastonbury Canal - much of it running straight as dye for mile after mile. Many spots where roads crossed the railway utilised manned level crossings rather than bridges, with each crossing having its own crossing keeper and railway cottage. 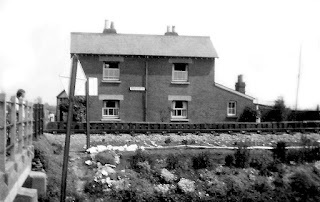 Several of the cottages had no running water or electricity right up to closure in 1966, the water being delivered by train in milk churns! 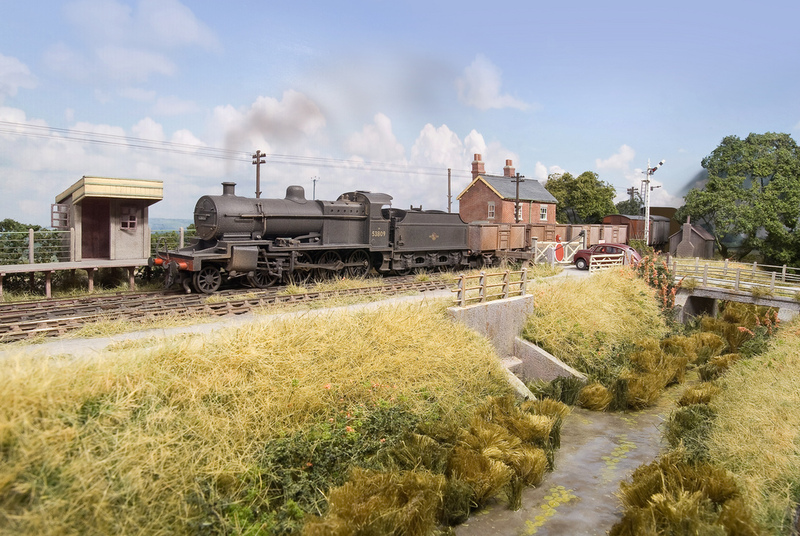 The model here, is a ‘could have been’ scenario is heavily influenced by the aforementioned BBC TV film, with the layout’s creator being taken in by the wild open feel of the area much dominated by willow, water and big skies (and the odd jug of rough farmhouse cider!). Catcott, was one of the many crossings on the line, but it never was a halt or had sidings. In the ‘parallel universe’ world here, imagine if to serve the local peat deposits things had been very different? Foamboard and ply contruction - light! In the summer of 2007, I came across some 5mm foamboard from some display boards about to the thrown out and it crossed my mind that they could form part of a lightweight baseboard. This was the catalyst! The baseboards sort of evolved over a couple of hours messing about on the longe floor from this lightweight material and then to toughen them up were finished off with an external shell of marine ply which can take impacts better than bare foamboard. The result being a very light but strong main baseboard which is ideal for single handily carting up and down stairs. Here we see Catcott’s entire 5 foot by 15 inches. The board can be lifted with just one finger if feeling brave. 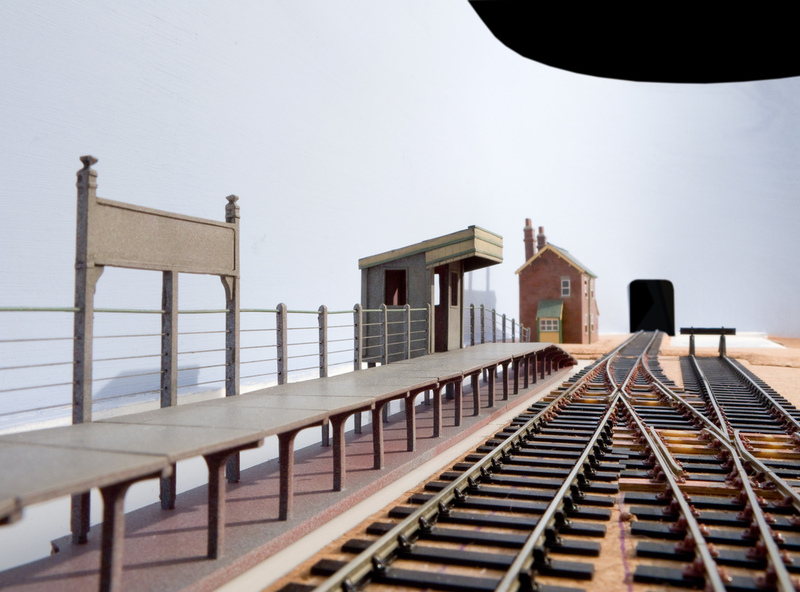 The backscene is formed of 2mm marine ply to allow a nice arc with no corners – for they would destroy the ‘big sky’ effect which is so important to the character of this layout. 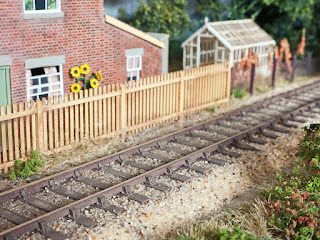 With previous layouts, I’ve used cassette type fiddle yards to manipulated stock when it is off stage. This is a good system, but I felt that with a small layout like Catcott and awful lot of time would be spent precariously turning whole trains around for their return run. For this reason I adopted the Denny Type Fiddle Yard which allow the turning of a whole train 360 degrees without risk of chucking it all on the floor or having to couple or uncouple locomotives and stock. 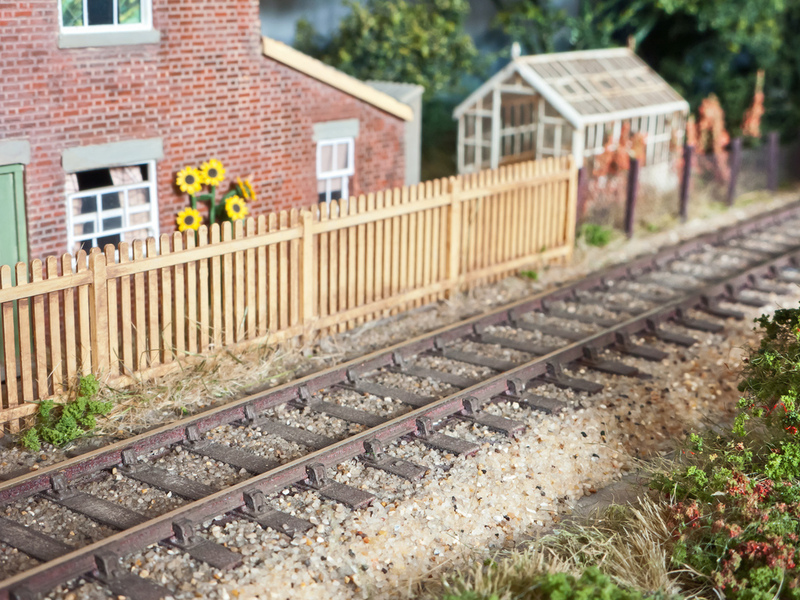 The only downside I can see is that if I wanted to hide the fiddle yards, the baseboard would have to be as wide as the longest train, though I find that people are often happier looking at this part of the layout in the open than the scenic section! The slightly tatty effect of spinning the 360 degree plate around will shortly be addressed with some fine slippery cloth that I’ll bond to the surface before the layouts next outing. Right; the plate that can hold 4 complete trains with engines can rotate 360 degrees. This means that there is no need to lift the engine from one end to the other. 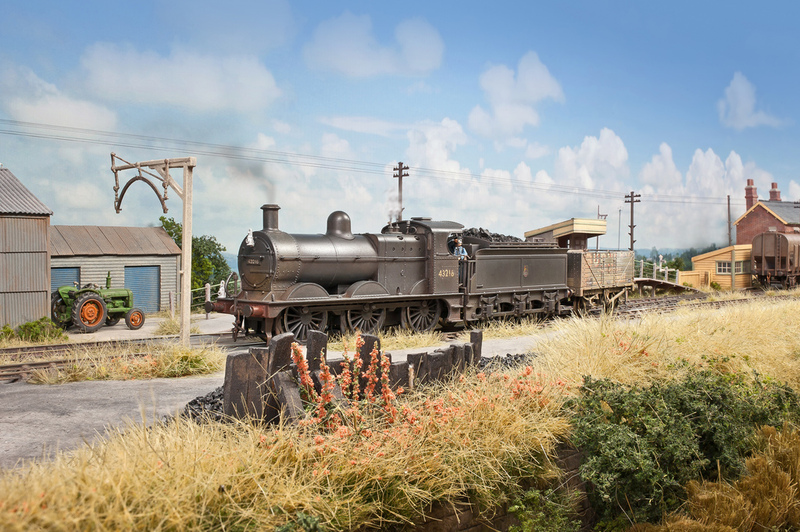 This design of fiddle yard was made famous by the great Peter Denny of ‘Buckingham’ fame – not surprisingly this design of yard is often referred to a ‘Denny Type Fiddle Yard’. This was a chance to built my own again; I hadn’t done this since Combwich in the early 1980s. Much to my surprise I managed to locate the roller gauges that had been lying dormant for quarter or a century through various house moves! One thing that hasn’t been lying dormant is what there now is available to aid the mad keen souls who wish to built there own track – well pointwork to be more precise, for gone are the days of replicating bullhead rail chairs with big blobs of solder. Now we have the like of C&L who produce highly realistic ready to lay bullhead flexitrack and the various components to make great looking pointwork. With a layout this small I felt that there was no excuse not to use the best that is available. To make up the plans for the points, I used the inexpensive downloadable software called Templot. Whilst the initial learning curve to get the best out of this package may be a little steep, there is plenty of online help though the Templot Forum and RM web. Actually to be honest, one very kind soul sent me an email with precise instructions to create exactly what I wanted! The resulting crossover is around 2 feet long, and is pretty well scale length, it being the minimum I could get away with to unsure no buffer lock when propelling a 4 wheeled 16 ton mineral wagon with a long Western Class 52 diesel when using scale couplings. 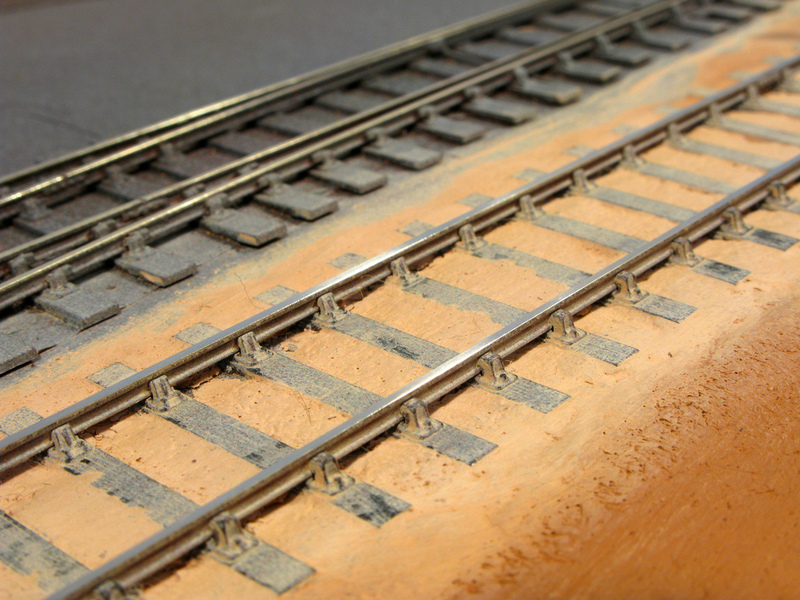 Once the track was laid after following the C&L instructions for making up the pointwork, it was ballasted in two different ways; firstly I wanted to replicate the fine ash and clinker used in sidings. This is an area frequently misrepresented with course granite – quite often by the rivet counter brigade too! 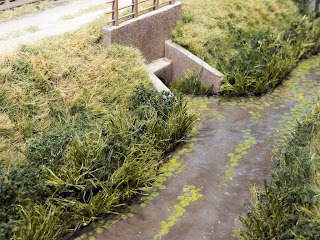 I think this is due to people making models of models rather than using old photographs of the real thing – who knows? To create this effect I used Humbrol Dry Clay, working it in and around the track with a screwdriver and then pummelling it into place with a stiff brush. In turn it was painted with pale greys and beiges. Ash and clinker is of course dark when seen close up, but when outside from some distance it takes pale tones – this is known as scale colour. The main running line required something coarser. Many use N gauge granite chippings. To my eyes at least it still looks too coarse and is the wrong colour, it is also tricky to use. 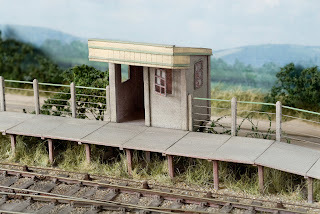 With Combwich my 25 year old layout I used sieved sand from the beach, so with Catcott I decided to use the same, the locality I chose on the south coast having a nice beige colour that makes a good base for what I wanted. Sand, because it’s formed by erosion over millions of years is made up from little spheres. The shape really helps the ballast to literally roll into place prior to dribbling with diluted PVA to fix it into place. By complete contrast, granite chippings being shards of rock do not roll where you want them to, making the whole procedure a taxing exercise. Colour adjustment can then be performed with thinned down matt enamel until the desired effect is achieved by copying photographs of the real thing, not other layouts. Be inspired by the real thing! In the days of steam, only the main running lines were ballasted with granite chippings. Sidings were usually ballasted with fine clinker or ash. This is an area often ignored by the most dedicated of rivet counters. Catcott crossing keeper’s cottage is based on what few photographs I have been able to uncover. Typically after I more or less finished the little building, I then came across some 1930’s pictures revealing that the entrance on the front of the building is in fact a later addition after the railway shut. Oh, well, it doesn’t detract and removing it would be tricky, if not impossible without spoiling the side – so it remains! The cottage is made up mainly from plastic card using commercial available brick effect sheets. The roof has several hundred small ‘slates’ made up from junk mail stuck on individually. This really doesn’t take very long if a fresh pointed hobby knife blade is used to position them. Nothing comes close in my opinion, not even strips of scribed paper which look like just that. A bluish grey enamel paint was used to complete the effect. Chimney pots are made up from rolled up paper, and the sash windows are thin strips of self adhesive label stuck to clear plastic sheet. The brick effect, after painting it in ‘brick red’ (whatever that is) was then washed over with magnolia matt emulsion and wiped off to leave it in the groves. Colour pencils were then used to create further variations of brick colour. The wonky guttering and downpipes are from plastic strip and some leftovers from a Wills good shed kit! 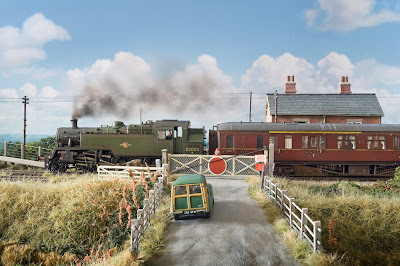 The level crossing gates were very kindly acquired second hand from 009 guru John Thorne are Model Signal Engineering white metal ones which can be hacked about to represent various different railways. Whilst they do open and close and holes are in the base to allow remote operation eventually, though to be honest mechanical gizmos are not really my thing so that might be years away! The little good shed, is a quickie, it starting life as the well known Wills kit. The base has been changed to stone and the moulded tile roof slates have been replaced with corrugated iron. The structure I’m most proud of is the pre fabricated Southern Railway concrete platform which is similar to that of Ashcott & Meare Station and Stourpaine & Durweston halt on the actual S&DJR and other stations on the former Southern that survive to this day. The thought of carving out the platform supports filled me with dread until I found that Monty’s Model Railways aka Dart Castings produced them in white metal. A quick look at there website would suggest that the rear section is now not made any more (please prove me wrong, for there’s a business opportunity for somebody!). To aid construction if what could be a very weak structure was built up on a 2mm plastic base to allow me to work ground up allowing me to drill holes to accept the supports. The concrete platform tops are made up from little squares of 1.5mm plastic sheet. Rather than scribing one long sheet for the surface, using individual squares like the real thing allowed the slightly wonky effect often seen on the prototype. 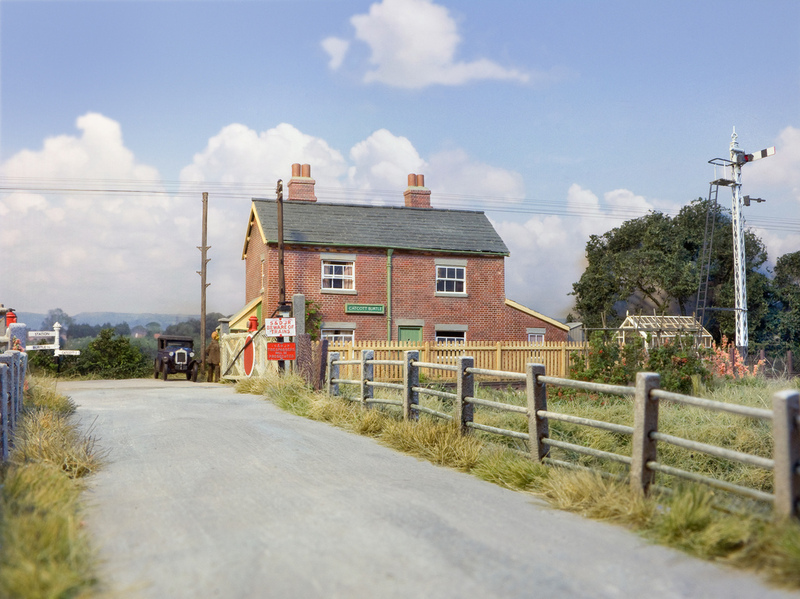 The shelter, again based on Stourpaine & Durweston is scratchbuilt from plastic card using photographs of the real thing. Like with the platform, it is a standard design still seen on the former southern Region. 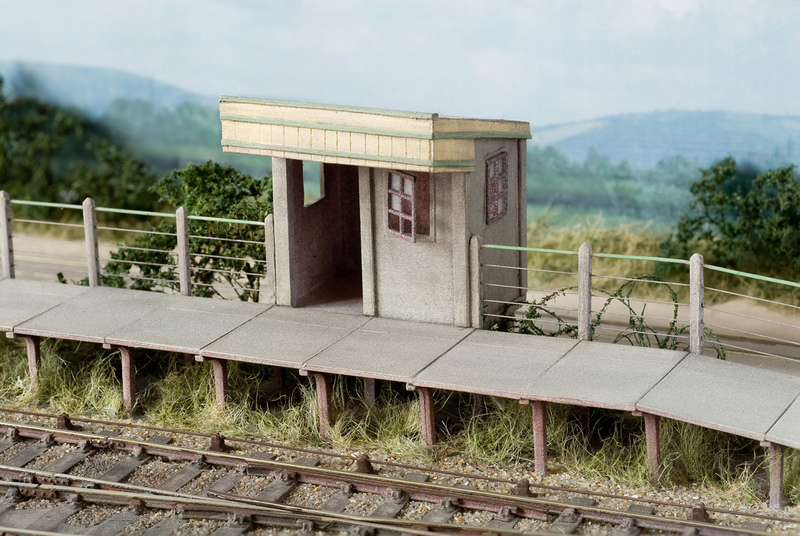 The concrete effect seen on this and other structures on the layout is a doddle. It is just white, red, grey primer and matt black misted on from aerosols from a few feet away. The slightly speckled effect is dumbed down with buff coloured interior matt emusion washed on then mostly wiped off. Simple! 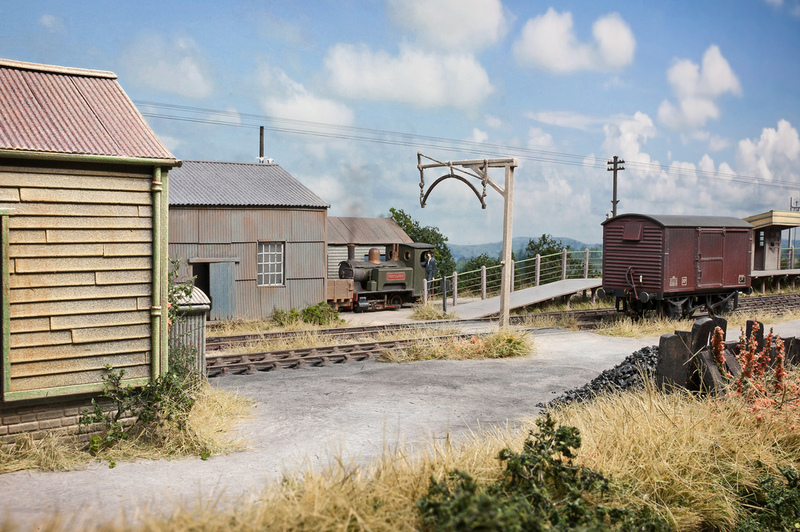 With a layout as narrow as this, it to me was important that the backscene is a nice neat job, for there would be no room for paint brush marks and dodgy handiwork. The Somerset Levels are known for their big skies, so I was very keen to represent this feature as effectively as possible. Taking pictures for *Hornby Magazine has also made me very aware of layout backscenes, or frequently very low or even total lack of. Unlike in the magazine where I frequently have to remove the layout owners front room or garage from the pictures digitally and then pop in some kind of sky in place, I was very keen with this project not to have too do any clever electronic jiggerypokery picture wise, wanting the viewer at a show to see the layout for real just as it is here. I’d been messing about merging photographs in the past – usually panoramic scenes taken off the top of buildings when on holiday and whilst these had been fun technical exercises they were really of little use. At last though I had a plan for the technique, and a visit to the actual area on a nice summer’s day (the 9th of July 2007 actually) allowed me to take a selection of photographs with a good overlap – and what better way to commemorate 40 years of the end of steam on the Southern? After a little work in Photoshop using panorama tools I ended up with a 7 foot by 14 inch file, and through a connection of our very own ‘Ed’ Mike Wild, a week or two later I ended up with hard copy on sticky backed plastic. The seamless 7 foot long photograph was pressed into place onto the curved plywood backscene base and then sprayed with matt varnish to make it ‘wipe clean’ and to get rid of the shine. SceneryMy favourite bit, and in my view the most important element of any model railway; scenery is the element that can be judged by someone with no interest in our weird obsessive hobby. Some people judge realism by the correct number of spokes on a particular locomotive or whether the motion bracket on their Ivatt Class 2 was correct for the 12th of March 1949 – though to be honest unless you have the drawing or a photograph in front of you, it’s most likely that you’re going to be painfully dull person to invite to a dinner party where nobody is ever going to know or care. The grass – this is something that for years people have been representing using that wretched lurid green ground up sponge from the local model shop. Even those rivet counters who can probably tell you the inside diameter of that hidden bolt not seen since the locomotive was put together at Crewe Works in 1889 will often use that product, which if you were just an inch high looks like that squidgy thing you wash the car with every second Saturday afternoon (or in my case maybe once of year). 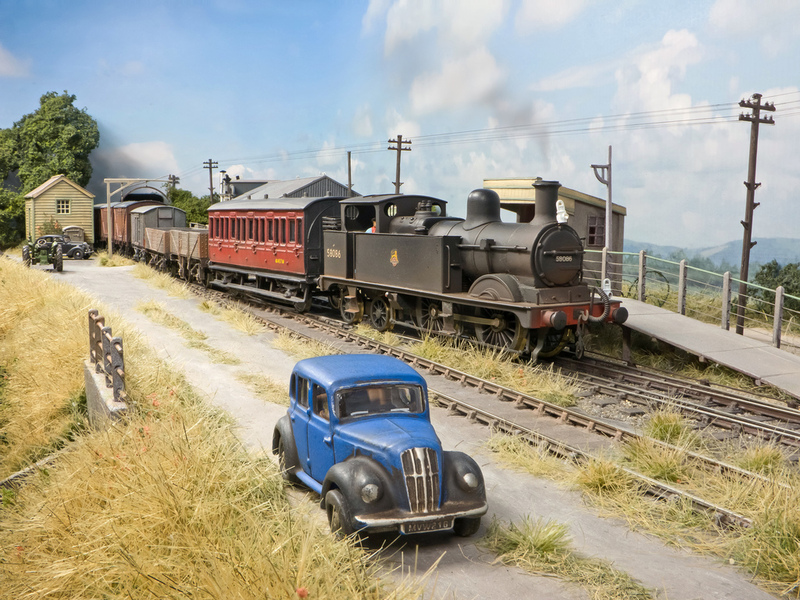 Grass is fibrous; it even was in the halcyon day of steam and these days we have many alternatives available to use, either from the local DIY store or model shop. On Catcott I used a mixture of three different materials, each having that all important fibrous characteristic. Hanging basket liner – get the green fibrous one hanging basket liner is a very economical means to a great looking result, the trick after gluing it down is to then thin it out and trim it well. A little water colour or acrylic can then be applied as needed to vary the colour. Silfor grass matting from International Models was used extensively, their ‘Long Winter Pasture’ suiting the English landscape the best, some of their other colours are just too rich for my liking. I find the trick with Silfor is to cut it into small random shapes and stick it down like a large jig-saw rather than try to lay it all in one big sheet. In some places the tips of the Silfor fibres were dry-brushed with beige to lighten the ends for that late summer look. 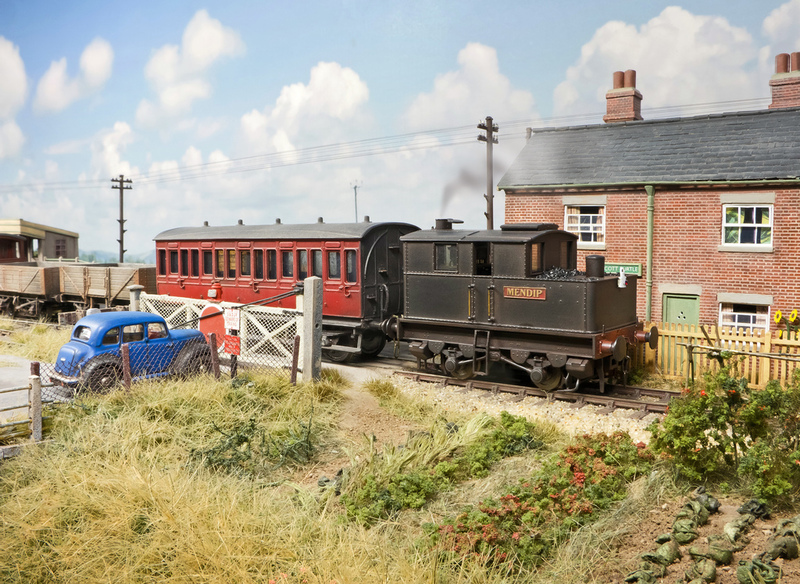 Noch Static Grass applied with their famous Grasmaster as favoured by Mike Wild on Bay Street Mk2 was also used randomly in varying amounts. I really like the ‘tall’ 6mm grasses mixing together mainly beige with a dash of green for that later summer look. The few trees and bushes are either ‘sea foam’ dusted in that dreaded green foam (which looks more like leaves than grass) or made up from twisted wire, covered in masking tape, plaster before spraying grey. 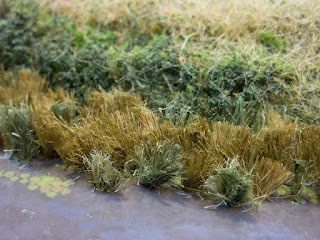 The foliage is Woodland Scenics ‘Polyfiber’ stretched out like a gossamer and coated on more of that ground up foam. 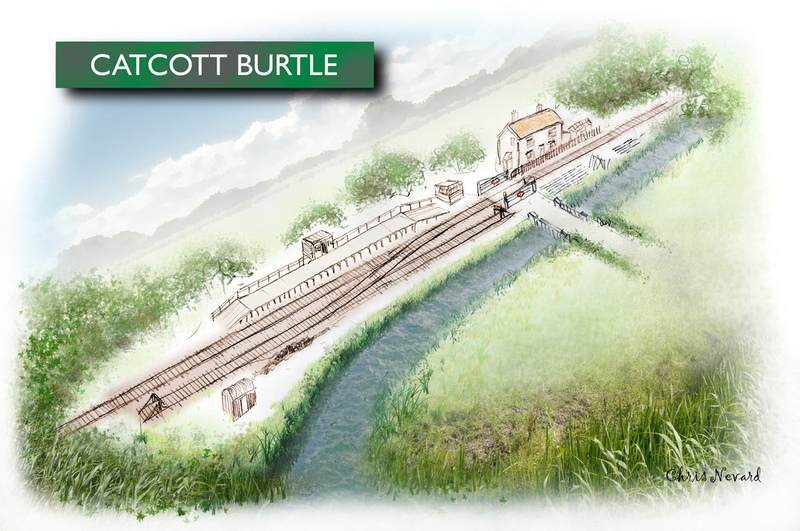 Much of the railway was built along the course of the Glastonbury Canal, but nearer the coast the waterway ran parallel with the railway giving that distinctive character. Reeds are made up from some coloured plumber’s hemp and asparagus tops sprayed with diluted PVA glue. 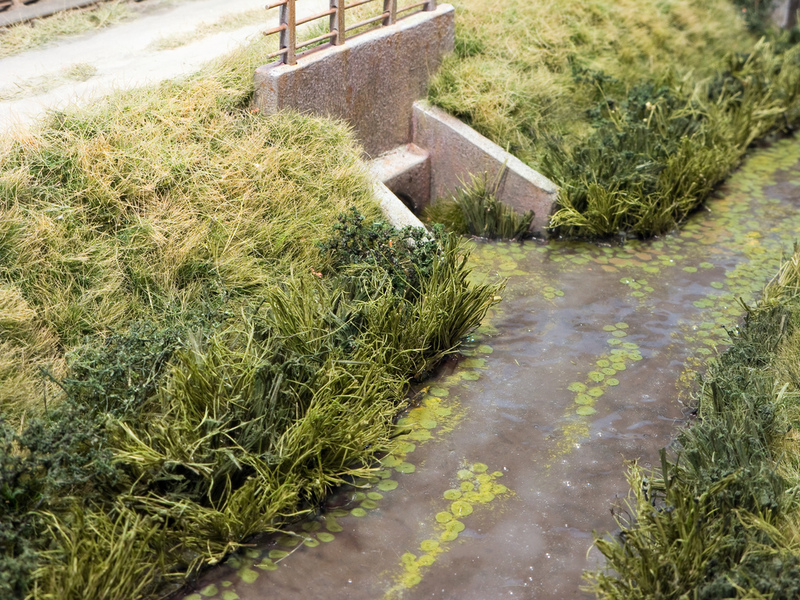 The water is borrowed from ace modelling guru Allan Downes, which consists of several coats of thick PVA over brown and grey paint. Water lilies are little circles of olive green paint and the whole lot is sealed under a thin layer of Humbrol gloss enamel to give a little extra ‘wetness’. In the ‘olden days’ before ready washed clingfilm wrapped food, much use was made of the trackside to grow vegetables and the little crossing here is no exception. The soil is from Treemendous (I can imagine a big hole in the producer’s back garden) and the various horticulture represented is coloured foam, rolled up paper and blobs of paint to create the desired effect. The highlight has to be the bamboo frame for the beans, or is it peas or even hops for the homebrew? That is brass wired soldered up. (written 19 Aug 2012) Catcott was a chance to try lots of new techniques, but above all provide a bit of theatre in a pint sized area whist trying to represent something that gives the impression of much bigger space, the big sky being the key ingredient. The photographer's car, posed in front of the mixed train from Bridgwater.